Whether you’re in Baltimore or in Łódź, Parallel Octave has all the Greek choruses you can eat this Sunday, December 2nd at noon! 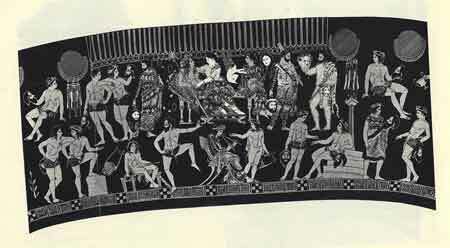 A satyr chorus. Doing what satyr choruses do. This Sunday (12/2), Parallel Octave will host an open poetry-recording/chanting session as part of CHURCH, an afternoon of new spiritual rituals at the Holy Underground. 12/2/12. Come at 12 noon. If you’re interested, feel free to email paralleloctave@gmail.com for more details. ancient Greek comedies and dramas. For anyone–actors, singers, etc.–who would like to join the Greek chorus of this production, all you have to do is show up at Fabryka Sztuki at 12 noon on Sunday the 2nd, the day of the show, and rehearse with us for four hours. Dla tego pokazu, nasz chór projektu jest otwarty dla znajomych. Zapraszamy do udziału w chórze greckim, który wystąpi podczas tego spektaklu. Wystarczy pojawić się w Fabryce Sztuki w dniu przedstawienia — w niedzielę, 2. grudnia o godz. 12. Próba potrwa cztery godziny.